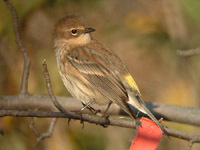 Each spring thousands of warblers, thrushes, sparrows and other landbirds use Montrose Point for feeding and resting. Spring migration begins in March as the earliest and hardiest songbirds begin to return. The peak of spring migration for passerines at Montrose is in May. A warm front and accompanying south winds will bring hordes of hungry migrants seeking food and shelter. Occasionally a phenomenon known as a fallout occurs. This happens when a cold front hits a wave of migrants during the night and forces them to the nearest land. Because of the cold temperatures (and often wind and rain), many otherwise arboreal birds are forced to the ground to find food and shelter. Whip-poor-wills are sometimes flushed from the shrubs and bushes in late April and early May; occasionally one will even be found roosting in a tree or on the ground. The open nature of Montrose makes it an excellent place to study flycatchers, particularily the Empidonax. Least, Willow, Alder, and Yellow-bellied are all regular in May and early June. Olive-sided Flycatchers are seen most springs, usually perched on a bare branch or snag. Of the vireos, Red-eyed, Warbling, Philadelphia, Blue-headed, and Yellow-throated occur every spring. White-eyed and Bell's Vireos are also occasionally seen. The Meadow and the Dunes are both excellent places to find Marsh and Sedge Wrens, especially in early May. All of the Catharus thrushes and Wood Thrush are regular; large numbers of these thrushes can often be heard migrating overhead at night. American Pipits are regular at Montrose with two peaks, one in late March and early April the other in early May. Scarlet Tanagers begin to arrive in late April; after a night of south winds in May, small flocks of these neotropical migrants can be found adorning the tops of trees. Summer Tanagers are rare but regular visitors, usually in May. Montrose is an excellent place to see warblers. Again, the scattered trees and open nature of the Point make for relatively easy warblering, though this fact won't prevent warbler neck. To date, 38 species of warblers have been recorded, and of these 29 are regular in spring. Montrose is especially good for Mourning and Connecticut Warblers, which find the shrubs and hedges particularly attractive. Without a doubt Montrose is the best place in Illinois and probably the best place in the entire Midwest for sparrows. Of the more uncommon species, Clay-colored is regular in May and Harris's Sparrow is seen most springs, as are Lark Sparrows. Montrose's main claim to sparrow fame however are the furtive, grass-loving species. LeConte's, Henslow's, Nelson's, and Grasshopper are regular visitors, the LeConte's, Henslow's, and Grasshopper in mid and late April, the Nelson's in late May. The Dunes and Meadow are by far the best places to see these skulkers. Baltimore Orioles can be abundant in May and Orchard Orioles are regular in small numbers in May. Both species show a predilection for the newly-opened flowers of the Norway Maple. The fall migration of passerines is also impressive, though more drawn out and less frenetic than in spring. Many birds found commonly during the spring are uncommon or less noticeable in the fall, such as the colorful tanagers and orioles. 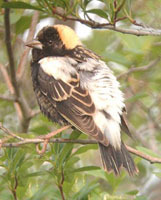 The potential for rarities and vagrants is greater in the fall however, and several birds are actually more frequent. Although large flights of Common Nighthawks seem to be a thing of the past, numbers can still be seen moving by the Point in August and early September. When Northern Shrikes are around, the Meadow and other open areas are excellent places to see this predatory songbird. Until fairly recently, Montrose was a major staging area for southbound Purple Martins in August and September. Sadly, only a handful are seen anymore, and most of these are the local nesting birds. Sparrows are better in fall than in spring at Montrose; on one memorable day in October of 2000, an incredible 17 species were seen by several observers, one of the highest totals in the United States. Harris's Sparrow is recorded every October or November, and Nelson's and LeConte's Sparrows also occur regularly. In recent years, Nelson's have been found with regularity in the Dune vegetation in September and October. Lapland Longspurs and Snow buntings like the more open areas of the Point, especially the Dunes and Montrose Beach. Laps start to appear in mid-September and Snow Buntings begin to show up in mid-October.